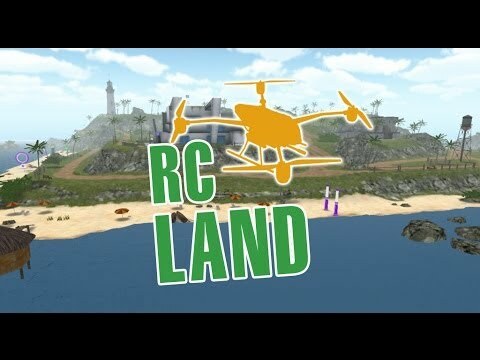 RC Land Quadcopter FPV Race - simulation game lovers of extreme fly on a radio-controlled quadrocopter. Flying over the beautiful sea island, you will gain new skills and brighten control drone while waiting in a traffic jam. This is - one of the best modern simulators, remote-controlled model quadrocopter! - During gameplay, you have to make 24 exciting missions using quadrocopter with FPV system. As there is a possibility of free flight over the island. - Practice in high-speed flight and it will let you economize on real quadrocopter`s spare parts. - Type of drone: joysticks, simplified joysticks, accelerometer or gamepad. - Interactive selection between 3 camera modes, adds new perspectives exciting missions. - Catch money and bonuses on the fly to buy weapons and spare parts. - Buy motors of three power levels and weapons in the garage. - Don`t let ground and water transport get away (ATV, boat, jet ski) keeping distance. - Destroy target using paintball marker or Roman candles. Well-designed graphics, which is combined with physics, gives you the opportunity to feel like a pilot combat quadrocopter (UAV)! A lot of new features now are under development and soon will be included. Have a fun flight!